Bal Keshav Thackeray (also known as Balasaheb Thackeray; Marathi pronunciation: [ʈʰaːkəɾeː]; 23 January 1926 – 17 November 2012) was an Indian politician who founded the Shiv Sena, a right-wing pro-Marathi and Hindu nationalist party active mainly in the state of Maharashtra. Thackeray began his professional career as a cartoonist with the English-language daily The Free Press Journal in Mumbai, but he left the paper in 1960 to form his own political weekly, Marmik. His political philosophy was largely shaped by his father Keshav Sitaram Thackeray, a leading figure in the Samyukta Maharashtra (United Maharashtra) movement, which advocated the creation of a separate linguistic state for Marathi speakers. 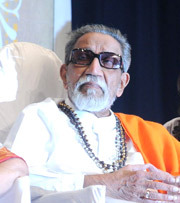 Through Marmik, Bal Thackeray campaigned against the growing influence of non-Marathis in Mumbai. In 1966, Thackeray formed the Shiv Sena party to advocate for the interests of Maharashtrians in Mumbai's political and professional landscape, and against certain segments of Mumbai's Muslim population. He had a large political influence in the state, especially in Mumbai; the Shiv Sena frequently used violent means against its detractors. A government inquiry found that Thackeray and Chief Minister Manohar Joshi incited members of the Shiv Sena to commit violence against Muslims during the 1992–1993 Bombay riots. In the late 1960s and early 1970s, Thackeray built the Shiv Sena by forming temporary alliances with nearly all of state's political parties. Thackeray was also the founder of the Marathi-language newspaper Saamana. After the riots of 1992-93, he and his party took a Hindutva stance. In 1999, Thackeray was banned from voting and contesting in any election for six years on the recommendations of the Election Commission for indulging in seeking votes in the name of religion. Thackeray was arrested multiple times and spent a brief stint in prison, but he never faced any major legal repercussions for his actions. Upon his death, he was accorded a state funeral, at which a large number of mourners were present. Thackeray did not hold any official positions, and he was never formally elected as the leader of his party. Thackeray was born in Pune on 23 January 1926 to Ramabai and Keshav Sitaram Thackeray (also known as 'Prabodhankar'). He was the eldest of nine siblings, and his family belonged to the Marathi Chandraseniya Kayastha Prabhu or CKP community. Keshav Thackeray was a social activist and writer who was involved in the Samyukta Maharashtra Movement of the 1950s, which argued for the creation of a unified state called Maharashtra for Marathi-speaking areas with Mumbai as its capital. Bal Thackeray was inspired by his father's political philosophy. Thackeray began his career as a cartoonist in the Free Press Journal in Mumbai. His cartoons were also published in the Sunday edition of The Times of India. In 1960, he launched the cartoon weekly Marmik with his brother Srikant. He used it to campaign against the growing numbers and influence of non-Marathi people in Mumbai, targeting the South Indian population. After Thackeray's differences with the Free Press Journal, he and four or five people, including politician George Fernandes, left the paper and started their own daily, News Day. The paper survived for one or two months. The success of Marmik prompted Thackeray to form the Shiv Sena on 19 June 1966. The name "Shiv Sena" (Shivaji's Army) was after the 17th century Maratha king. Initially, Thackeray said it was not a political party but an army of Shivaji Maharaj, inclined to fight for the Marathi manoos (person). It demanded that native speakers of the state's local language Marathi (the "sons of the soil" movement) be given preferential treatment in private and public sector jobs. The early objective of the Shiv Sena was to ensure their job security competing against South Indians and Gujaratis. In its 1966 party manifesto, Thackeray primarily blamed south Indians. In Marmik, Thackeray published a list of corporate officials from a local directory, many being south Indians, citing it as proof that Maharashtrians were being discriminated against. His party grew in the next ten years. Senior leaders such as Babasaheb Purandare, chief attorney for Trade Union of Maharashtra Madhav Mehere joined the party and chartered architect Madhav Gajanan Deshpande backed various aspects of the party operations. In 1969, Thackeray and Manohar Joshi were jailed after participating in a protest demanding the merger of Karwar, Belgaum and Nipani regions in Maharashtra. During the 1970s, it did not succeed in the local elections and it was active mainly in Bombay, compared to the rest of the state. The party set up local branch offices and settled disputes, complaints against the government. It later started violent tactics with attacks against rival parties, migrants and the media; the party agitated by destroying public and private property. Thackeray publicly supported Indira Gandhi during the 1975 Emergency to avoid getting arrested; Thackeray supported the Congress party numerous times. Dr. Hemchandra Gupte, Mayor of Bombay and the former family physician and confidante of Thackeray, left Shivsena in 1976 citing importance given to money, violence committed by the Shiv Sena members and Thackeray's support for Mrs.Gandhi and the 1975 emergency. Politically, the Shiv Sena was anti-communist, and wrested control of trade unions in Mumbai from the Communist Party of India (CPI). Local unemployed youth from the declining textile industry joined the party and it further expanded because of Marathi migrants from the Konkan region. By the 1980s, it became a threat to the ruling Congress party which initially encouraged it because of it rivalling the CPI. In 1989, the Sena's newspaper Saamna was launched by Thackeray. Because of Thackeray being against the Mandal Commission report, his close aide Chhagan Bhujbal left the party in 1991. Following the 1992 Bombay riots, Thackeray took stances viewed as anti-Muslim and based on Hindutva. Shiv Sena later allied itself with the Bharatiya Janata Party (BJP). The BJP-Shiv Sena alliance won the 1995 Maharashtra State Assembly elections and were in power from 1995 to 1999. Thackeray declared himself to be the "remote control" chief minister. Thackeray and the Chief Minister Manohar Joshi were explicitly named for inciting the Shivsainiks for violence against Muslims during the 1992–1993 riots in an inquiry ordered by the government of India, the Srikrishna Commission Report. Thackeray was criticised for his praise of Adolf Hitler which he later neither admitted nor denied. He was quoted by Asiaweek as saying: "I am a great admirer of Hitler, and I am not ashamed to say so! I do not say that I agree with all the methods he employed, but he was a wonderful organiser and orator, and I feel that he and I have several things in common...What India really needs is a dictator who will rule benevolently, but with an iron hand." In a 1993 interview, Thackeray stated, "There is nothing wrong" if "Muslims are treated as Jews were in Nazi Germany." In another 1992 interview, Thackeray stated, "If you take Mein Kampf and if you remove the word 'Jew' and put in the word 'Muslim', that is what I believe in". Indian Express published an interview on 29 January 2007: "Hitler did very cruel and ugly things. But he was an artist, I love him [for that]. He had the power to carry the whole nation, the mob with him. You have to think what magic he had. He was a miracle...The killing of Jews was wrong. But the good part about Hitler was that he was an artist. He was a daredevil. He had good qualities and bad. I may also have good qualities and bad ones." In 2009, he criticised Indian cricketer Sachin Tendulkar, a "Marathi icon", for saying he was an Indian before he was a Maharashtrian. Thackeray firmly opposed caste based reservation and said - "There are only two castes in the world, the rich are rich and the poor is poor, make the poor rich but don't make the rich poor. Besides these two castes I don't believe in any other casteism." The Bhartiya Janata Party (BJP) supported caste based reservations based on the Mandal commission. Thackarey, despite being warned that opposition to the reservations would be politically suicidal for the Shiv Sena party, opposed the BJP over this issue and said he would initiate "divorce proceedings against the BJP" if the BJP supported caste based reservations. This also let to his conflict with Chagan Bhujbal, an OBC, who later left the Shiv Sena. Thackeray defended Savarkar against criticism and praised him as a great leader. In 2002, when President A. P. J. Abdul Kalam unveiled a portrait of Savarkar in the presence of Prime Minister Atal Bihari Vajpayee, the Congress Party opposed the unveiling of the portrait and boycotted the function. Thackarey criticized the opposition and said "Who is [Congress president and Leader of the Opposition] Sonia Gandhi to object to the portrait? What relation does she have with the country? How much does she know about the history and culture of India?". Years later, when Congress General Secretary Digvijay Singh made a statement that Savarkar was the first to suggest the two-nation theory that led to the partition, Thackeray defended Savarkar and accused Singh of distorting history. Thackeray died on 17 November 2012 as a consequence of a cardiac arrest. Mumbai came to a virtual halt immediately as the news broke out about his death, with shops and commercial establishments shutting down. The entire state of Maharashtra was put on high alert. The police appealed for calm and 20,000 Mumbai police officers, 15 units of the State Reserve Police Force and three contingents of the Rapid Action Force were deployed. It was reported that Shiv Sena workers forced shops to close down in some areas. The then Prime Minister Manmohan Singh called for calm in the city and praised Thackeray's "strong leadership", while there were also statements of praise and condolences from other senior politicians such as the then-Gujarat Chief Minister (later The Prime Minister of India) Narendra Modi and the BJP leader and MP (Former Deputy Prime Minister of India), L. K. Advani. Thackeray was called 'Balasaheb' and Hindu Hruday Samrat ("Emperor of Hindu Hearts") by his supporters. His yearly address at Shivaji Park was popular among his followers. In 2012, he instead gave a video-taped speech and urged his followers "to give the same love and affection to his son and political heir Uddhav as they had given him". Thackeray was known to convert popular sentiment into votes, getting into controversies and making no apologies for it though his son has tried to tone down the party's stance after his death. He was known for his inflammatory writings, was seen as a good orator who used cruel humour to engage his audience. He had a large political influence throughout the state, especially in Mumbai. His party never had any formal internal elections nor was he ever formally elected as its chief at any point. Gyan Prakash said, "Of course, the Samyukta Maharashtra Movement had mobilized Marathi speakers as a political entity, but it was Thackeray who successfully deployed it as an anti-immigrant, populist force." He inspired Baliram Kashyap the leader of Bastar who often regarded as the Thackeray of Bastar. Raj is his brother Srikant's son. Despite Raj's breakaway from the main party, Raj continues to maintain that Thackeray was his ideologue and relations between them improved during Thackeray's final years. Raj broke away from Shiv sena to form his own political party called the Maharashtra Navnirman Sena. Sanjeevani Karandikar is Bal Thackeray's sister. Thackeray drew cartoons for Marmik and contributed to Saamna till 2012. He cited the British cartoonist David Low as his inspiration. In the Sarkar film series, the title character is loosely based on Thackeray. A Bollywood biopic titled Thackeray, starring Nawazuddin Siddiqui and written by Shiv Sena politician Sanjay Raut was released on 25 January 2019. ^ a b Vaibhav Purandare (2013). Bal Thackeray and the rise of Shiv Sena. Roli Books. p. 62. One more aspect of his personality, largely unknown, has been his love for the number 13,considered inauspicious by many. Thackeray said it is his lucky number. He married Sarla Vaidya, who became Meena Thackeray after marriage on 13 June 1948 and he launched Marmik weekly on 13 August 1960. ^ a b c Vaibhav Purandare (2012). Bal Thackeray and the rise of Shiv Sena. p. 26. ^ Berger, Peter; Heidemann, Frank. The Modern Anthropology of India: Ethnography, Themes and Theory. Routledge. p. 179. ^ a b c d e f g "The Firebrand Who Renamed Bombay: Bal Thackeray (1926–2012)". Nov. 17, 2012 Time World. 17 November 2012. Retrieved 14 June 2013. ^ a b c Kaminsky, Arnold P.; Long, Roger D. (2011). India Today: An Encyclopedia of Life in the Republic (illustrated ed.). ABC-CLIO. pp. 693–4. ISBN 978-0-313-37462-3. ^ a b The New York Times (18 November 2012). "Hundreds of Thousands Mourn Indian Politician Thackeray". The New York Times. ISSN 0362-4331. Retrieved 8 February 2016. ^ a b c d e f g h i j k l "Bal Thackeray's political career - BBC News". BBC News. Retrieved 29 January 2016. ^ a b Smita Narula (1999). Broken People: Caste Violence Against India's "untouchables". Human Rights Watch. ISBN 1564322289. The reports findings were presented to the government of Maharashtra on February 16, 1998, more than five years after the riots took place. The report determined that the riots were the result of a deliberate and systematic effort to incite violence against Muslims and singled out Shiv Sena leader Bal Thackeray and Chief Minister Manohar Joshi as responsible. The Shiv Sena-BJP government, however, refused to adopt the commission's recommendations and instead labeled the report anti-Hindu. ^ a b "The Shiv Sena indicted". Frontlineonnet.com. Archived from the original on 28 March 2013. Retrieved 14 June 2013. The Sena-Bharatiya Janata Party Government in Maharashtra has rejected the core of the report, which was presented before the two Houses of the legislature on August 6 along with a memorandum of action to be taken thereon. The Action Taken Report (ATR), seeks to establish that the report is one-sided. Going further, Chief Minister Manohar Joshi termed the report "anti-Hindu, pro-Muslim and biased." ^ "India". WAN-IFRA. Archived from the original on 10 April 2015. Retrieved 30 September 2012. ^ "Milestones in the life of Sena chief Bal Thackeray". hindustantimes. HT Media Limited. Archived from the original on 20 November 2012. Retrieved 2 November 2014. ^ "Comparative Studies of South Asia, Africa and the Middle East". South Asia Bulletin. University of California, Los Angeles. 16 (2): 116. 1996. Retrieved 15 November 2012. ^ a b c d e f g h i j "Leader who brought ethnic politics to Mumbai melting pot". The Hindu. 17 November 2012. ISSN 0971-751X. Retrieved 30 January 2016. ^ a b c Gyan Prakash (21 September 2010). Mumbai Fables. Princeton University Press. pp. 228–237. ISBN 978-0-691-15317-9. Retrieved 4 December 2012. ^ "Why no one dared to mess with Shiv Sena? : Special Report - India Today". indiatoday.intoday.in. Retrieved 9 February 2016. ^ "Obituary: Bal Thackeray-the tiger who ruled Mumbai : Bal Thackeray, News - India Today". indiatoday.intoday.in. Retrieved 11 February 2016. ^ a b c Bahree, Megha. "Thackeray Controlled Mumbai for Four Decades". Wall Street Journal. ISSN 0099-9660. Retrieved 8 February 2016. ^ Madhav Godbole (1 January 1996). Unfinished Innings: Recollections and Reflections of a Civil Servant. Orient Blackswan. p. 414. ISBN 978-81-250-0883-5. Retrieved 4 December 2012. ^ "Thackeray votes after expiry of ban". Hindustan Times. 26 April 2004. Archived from the original on 11 January 2014. Retrieved 14 June 2013. ^ "Banned from voting". The Hindu. 28 July 1999. Archived from the original on 25 April 2003. ^ "Thackeray for Hindu suicide squads". The Times of India. 15 October 2002. Retrieved 27 June 2013. ^ "Case filed against Thackeray for urging anti-terror suicide-squads". ExpressIndia.com. Archived from the original on 30 September 2007. Retrieved 25 August 2007. ^ "Despite Sena threat, 'MNIK' opens to packed theatres across country". TOI. 12 February 2010. Retrieved 28 February 2010. ^ "An open letter to Uddhav Thackeray". IBN. 12 February 2010. Retrieved 17 November 2012. ^ "Thackeray ke Bal par..." Mid Day. Archived from the original on 18 October 2009. Retrieved 14 October 2009. ^ "On the wrong track". The Hindu. Retrieved 11 August 2006. ^ "Diversionary tactics". The Hindu Frontline Magazine. Archived from the original on 14 November 2007. Retrieved 8 August 2008. ^ a b Mishra, Ambarish (19 November 2012). "राज महायात्रेत अलिप्त होते, कारण..." Maharashtra Times (in Marathi). Retrieved 20 November 2012. ^ "Thackeray condemns V-Day attacks by Sainiks". Mumbai: The Times of India. PTI. 18 February 2006. Retrieved 13 November 2012. ^ PTI 13 Feb 2006, 08.55pm IST (13 February 2006). "Thackeray suggests Indian version of V-Day — Times Of India". The Times of India. Retrieved 13 November 2012. ^ "Right-wing to go easy on couples this Valentine's Day". NDTV.com. ^ a b "Shiv Sena's North Indian leaders quit". The Times of India. 27 March 2008. Retrieved 4 April 2008. ^ "Delhi Shiv Sena chief resigns". Chennai, India: The Hindu. 28 March 2008. Archived from the original on 2 April 2008. Retrieved 4 April 2008. ^ iPad iPhone Android TIME TV Populist The Page. "TIME Magazine — Asia Edition — November 19, 2012 No. 21". Asiaweek.com. Retrieved 13 November 2012. ^ D’Souza, Dilip (30 November 2012). "Hitler's Strange Afterlife in India". The Daily Beast. ^ "Sorry". Indianexpress.com. Retrieved 13 November 2012. ^ Sherman Hollar (23 January 1927). "Bal Thackeray (Indian journalist and politician)". Britannica Online Encyclopedia. Retrieved 15 November 2012. ^ "Know your party: Shiv Sena — Lok Sabha Election 2009". In.rediff.com. 23 April 2004. Retrieved 31 March 2012. ^ "Thackeray lashes out at Prez again". Ibnlive.com. 3 February 2007. Retrieved 15 November 2012. ^ Mihir Bose (2006). The Magic of Indian Cricket: Cricket And Society in India. Taylor & Francis Group. p. 88. ISBN 978-0-415-35691-6. Retrieved 4 December 2012. ^ Suketu Mehta (27 September 2005). Maximum City. Random House Digital, Inc. p. 101. ISBN 978-0-375-70340-9. Retrieved 17 November 2012. ^ Bal Thackeray in India Today, Shiv Sena leader of Bombay, June 15, 1984. ^ a b "The Rediff Interview/ Bal Thackeray". Rediff.com. 21 January 1998. Retrieved 15 November 2012. ^ "Mumbai's unity a slap to fanatics: Thackeray". The Times Of India. 20 July 2006. ^ Leaders deliver hate speech with impunity. IBNLive, 7 April 2009. ^ "Hindustan of Hindus my dream: Thackeray". Indian Expres. 29 January 2007. Retrieved 20 November 2012. ^ a b c d "Rattled by Raj, Thackeray abuses Biharis news". The Indian Express. Retrieved 2 February 2008. ^ Vaibhav Purandare (2013). Bal Thackeray and the rise of Shiv Sena. Roli Books. p. 178. ^ "Bal Thackeray on casteism". rediff news. 2012. ^ "Thackeray defends Savarkar over Digvijay's statement". 31 January 2011 – via The Economic Times. ^ "Savarkar was a great leader: Thackeray". www.rediff.com. ^ Navnita Behera (2000). State, Identity & Violence: Jammu, Kashmir, and Ladakh. Manohar Publishers & Distributors. p. 232. ^ Ajit Chak (2000). Kashmir storm. ^ Arvind Gigoo (2000). The Ugly Kashmiri: (Cameos in exile). ^ Mumbai Bureau (15 November 2012). "States / Other States : Bal Thackeray passes away; funeral on Sunday". Chennai, India: The Hindu. Retrieved 19 November 2012. ^ Mankikar, Sayli Udas; Ghoge, Ketaki (18 November 2012). "Mumbai shuts down as Bal Thackeray makes final journey today". Hindustan Times. Mumbai, India. Archived from the original on 18 November 2012. Retrieved 18 November 2012. ^ "Security beefed up across Maharashtra". DNA India. PTI. Retrieved 17 November 2012. ^ "Traders bandh in Maharashtra tomorrow to pay homage to Bal Thackeray". Hindustan Times. PTI. 18 November 2012. Archived from the original on 18 November 2012. Retrieved 19 November 2012. ^ Jain, Bharti (20 November 2012). "State funeral: CM went by people's sentiments". The Times of India. Retrieved 3 August 2013. ^ "Thackeray funeral at 'public ground' Shivaji Park sparks debate". DNA India. 19 November 2012. Retrieved 7 December 2012. ^ Mankikar, Sayli Udas (19 November 2012). "Demand for Thackeray memorial at Shivaji Park". Hindustan Times. Archived from the original on 28 November 2012. Retrieved 7 December 2012. ^ "State funeral for Bal Thackeray, calm city lines up". financialexpress. Archived from the original on 29 October 2013. Retrieved 29 May 2013. ^ "Bal Thackeray passes away: Mumbai remains shut". Economic Times. 18 November 2012. Retrieved 19 November 2012. ^ "Maha end to Tiger journey". Deccan Chronicle. 19 November 2012. Archived from the original on 11 January 2013. Retrieved 19 November 2012. ^ "Mumbai returns to normal after Bal Thackeray funeral". BBC. 19 November 2012. Retrieved 30 November 2012. ^ "Nearly 20 lakh people join the funeral procession of Shiv Sena supremo Bal Thackeray as Mumbai comes to a standstill". India Today. 18 November 2012. Retrieved 19 November 2012. ^ "Shiv Sena chief Bal Thackeray cremated, Uddhav lights funeral pyre". Zee News. 19 November 2012. Retrieved 7 December 2012. ^ "Bal Thackeray's funeral procession gets massive live TV coverage". The Times of India. IANS. 19 November 2012. Archived from the original on 3 January 2013. Retrieved 7 December 2012. ^ "Bal Thackeray only non-MP to get obituary reference in Parliament". DNA India. IANS. 22 November 2012. Retrieved 7 December 2012. ^ a b "Shiv Sena pays Rs 5 lakh for Bal Thackeray's funeral expenses". May 24, 2013. Zee Media Bureau. Retrieved 29 May 2013. ^ "Bihar Assembly pays tribute to Bal Thackeray". Zeenews.india.com. 29 November 2012. Retrieved 14 June 2013. ^ PTI (29 November 2012). "Bihar assembly pays tribute to Sena chief Bal Thackeray". News.in.msn.com. Retrieved 14 June 2013. ^ "Bihar Assembly pays tribute to Shiv Sena chief Bal Thackeray". Ibnlive.in.com. Retrieved 14 June 2013. ^ "A troubling legacy". The Hindu. 19 November 2012. ISSN 0971-751X. Retrieved 7 February 2016. ^ Kaphle, Anup (19 November 2012). "Who was Bal Thackeray and why did Mumbai come to a standstill this weekend?". The Washington Post. ISSN 0190-8286. Retrieved 7 February 2016. ^ Purandare, Vaibhav (27 February 2013). Bal Thackeray and the rise of Shiv Sena. Roli Books Private Limited. pp. 23–27. ISBN 9788174369918. ^ Burns, John F. (2 December 1995). "New Delhi Journal; Another Rushdie Novel, Another Bitter Epilogue". The New York Times. Retrieved 17 November 2012. ^ Matzner, Deborah (Fall 2014). "Jai Bhim Comrade and the Politics of Sound in Urban Indian Visual Culture". Visual Anthropology Review. 30 (4): 127–138. ^ "A political saga of a cartoonist". Andhra Wishesh. 15 November 2012. Retrieved 17 November 2012. ^ IANS (17 November 2012). "Shiv Sena chief Bal Thackeray passes away". IANS. Retrieved 17 November 2012. ^ Burke, Jason (2014). "Aditya Thackeray: 24-year-old scion of India's controversial political dynasty". The Guardian (November 27). Guardian News and Media Limited or its affiliated companie. ^ "Nawazuddin Siddiqui's Bal Thackeray biopic to release on THIS date". dna. 22 March 2018. Retrieved 25 August 2018. ^ "Thackeray: Nawazuddin Siddiqui nails the look of the supremo Balasaheb Thackeray - Times of India". The Times of India. Retrieved 25 August 2018.